I love compliments, who doesn't? And I received a great one yesterday, gave me a lovely warm glow. 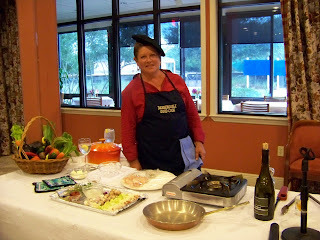 I attended the monthly cooking demonstration last night at the restaurant I had the cooking demo at in August. 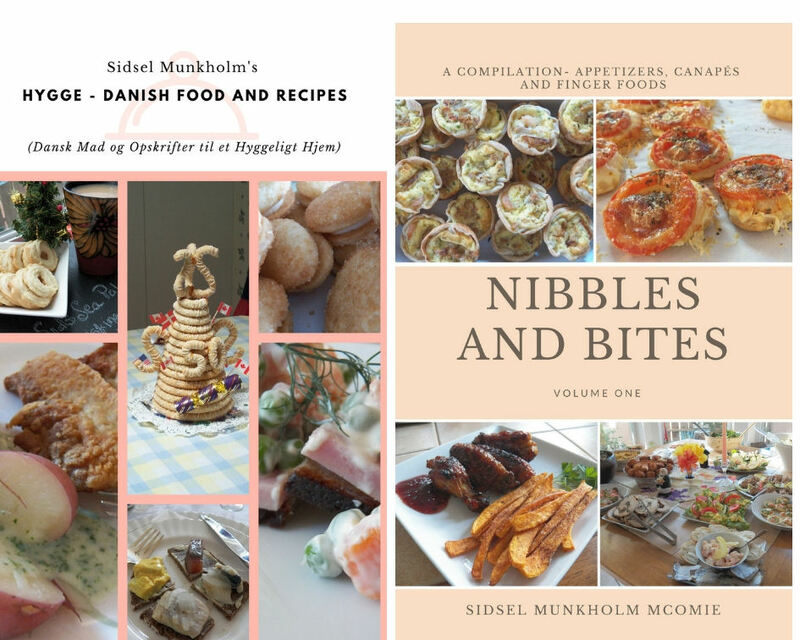 One of the attendees told me that they'd tried my recipe for Frikadeller at home and had really liked it. I think the next time I burn something, or over season a dish, and feel really discouraged, I'm going to try to remember that compliment. And that brings me to this. This month's cooking demonstration was a "Classic Country French Dinner" and the guest chef was Gaye Lass. And I have to say, I thoroughly enjoyed my meal. And now have another recipe I can make. This is a fussy meal in that it does consist of a lot of little steps, but the end result, well worth it. And even though there is some prep involved, once that's done, you can go do something else while the chicken cooks. 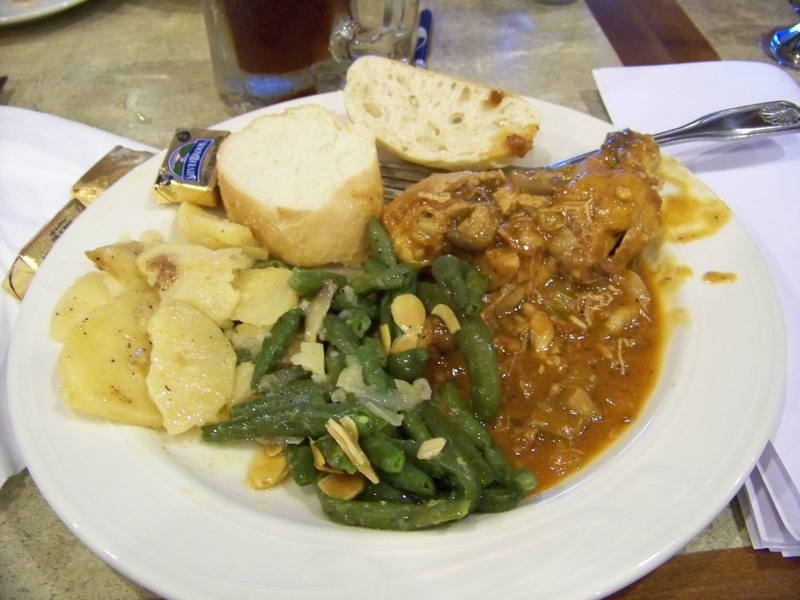 Coq au Vin used to be made out of the old rooster or laying hen, which was considered too tough to eat in any other way, other than by stewing it for a long time. The older the bird, the longer the cook time, but the flavour was incredible. 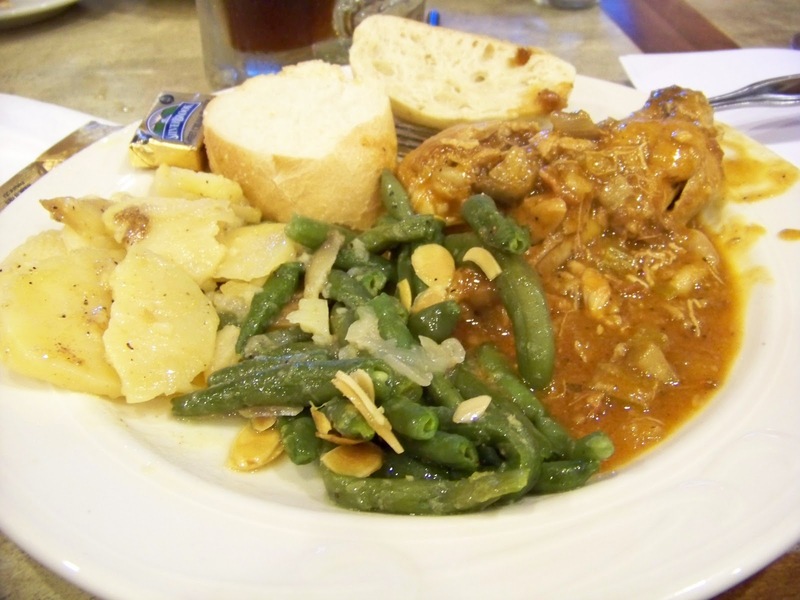 The meal consisted of Coq au Vin, Haricot Verts and Potatoes Boulangerie. 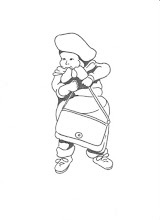 Here is the recipe for the Coq au Vin with the appropriate illustrations. 1 Bouquet Garni; 3 Bay Leaves, 3 sprigs Fresh Thyme, 1 spring Rosemary, 6 sprigs Parsley. Tie the herbs together into a bundle or bouquet with some kitchen twine or thread. 15 small pearl onions, (pierced on the root end with a sharp knife in a cross cut, keeps the onions whole during the cooking process). 1. Cut bacon and chicken into required size pieces. Tie Bouquet Garni herbs together. Dice the onion and celery ribs. Bring a pan of water to a boil and drop in the pearl onions, let boil rapidly for 2-3 minutes. Remove onions from boiling water and plunge them into a bowl of cold water, peel them. Pierce a deep cross cut in the root end of the onion with a small knife, this keeps the onions whole during cooking. 2. Coat a large Dutch oven or Rondeau with olive oil and bring to a medium high heat. Pat the chicken dry and season generously with salt to taste. Working in small batches, coat the chicken gently with flour and put immediately in the hot oil. Only flour chicken that is to be immediately put in the hot oil. No premature flouring. Premature flouring will result in doughy, gritty meal chicken rather than crispy. Brown on all sides, then remove from pan to paper towels to drain. Remove any excess oil from the pan. 3. Add the bacon lardons to the pan with a tiny splash of new olive oil. Cook the bacon until it's brown and crispy. Add the diced celery and onion and season to taste. Cook over medium heat until the veggies are starting to soften, and are aromatic, about 7-8 minutes. Add the garlic and cook one minute. Add the mushrooms next and cook until they start to give off their juices. Carefully pour in the cognac and ignite with a match or flame from the burner. Shake the pan back and forth for several seconds until the flames subside. 4. Add the tomato paste and stir to combine. The mixture will become very thick. Stir in the wine and bring the mixture to a boil, and cook for 4-5 minutes. Return the chicken legs and thighs to the pan. Stir in enough chicken stock until the chicken parts are partially covered by the stock. Add the Bouquet Garni and nutmeg, bring to a boil, then reduce heat to a simmer. Taste for seasoning and adjust if needed. Add the pearl onions, partially cover the pan and simmer for 20 minutes. 5. After the chicken has simmered for 20 minutes, turn the legs and thighs over and and add the chicken breasts. Check the liquid and add more stock, in order to keep 3/4 of the chicken under the liquid. Partially cover the pan and simmer for another 15 minutes. Remove the Bouquet Garni. 6. 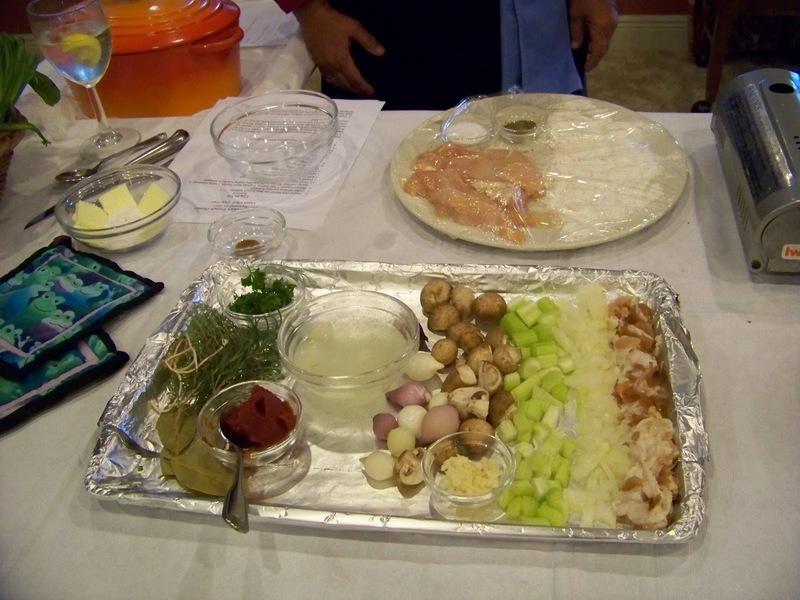 Remove the chicken, onions, mushrooms and bacon bits from the pot and arrange on a serving platter, and keep warm while you prepare the sauce. If the sauce is on the thin side, reduce it down until it becomes a thicker sauce. It can also be thickened quickly with a roux made of 1 tbls. butter and 1 tbls. flour stirred together and whisked into the sauce. Bring the sauce to a boil, stirring and deglazing the pot for 2 minutes until the sauce is thickened. 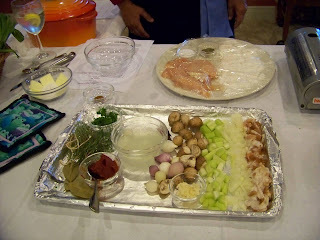 Pour the sauce over the chicken, mushroom and onions, garnish with parsley and serve. This meal was wonderful and I'll share the Potato recipe another day, as well as the Haricots Verts and I'm not forgetting the Poached Pears in Wine that was served for dessert. 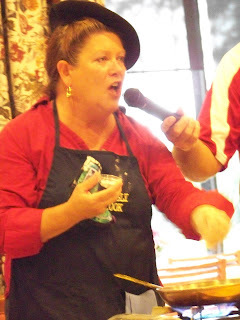 All in all, a fun evening, with great food and best of all, I got a new recipe to try. * June 2012 I would like to add to this post. Last weekend Gaye passed away. She was far too young, and leaves behind 2 children and many friends. She will long be remembered in our area as a fantastic cook, and I know I will miss trying her many dishes. Rest in Peace Gaye.